BRIDGEPORT, Conn. (CN) — The families of six murdered teachers and children sued radio host Alex Jones on Wednesday over his promotion of the conspiracy theory that the mass shooting at Sandy Hook Elementary School was a hoax. One FBI agent who responded to the gruesome scene is also named as a plaintiff. Taking aim at Jones, Wolfgang Halbig and Cory Sklanka — two self-styled investigators whom the Infowars creator frequently brings on as guests — the complaint filed this morning in Bridgeport Superior Court says greed is all the explanation there is for why anyone would spread such hurtful lies. “It is a very lucrative business model,” the complaint states. The complaint specifies that the products Jones hawks are “in line with the paranoid worldview he promotes.” They include “open currency” precious metals, “male-enhancement” elixirs, gas masks and body armor, and customized appendages for AR-15s. At 42 pages, the complaint in Connecticut is more than twice the length of identical suits brought against Jones by two other Sandy Hook parents in Texas last month. “The First Amendment has never protected demonstrably false, malicious statements like [those of] the defendants,” the complaint states. Each of the plaintiffs also contends that Jones’ spread of the false Sandy Hook narrative has caused them specific damages. While some have had to “confront strange individuals videotaping them and their children,” they all face a constant barrage of death threats and harassment on social media. Halbig, a 70-year-old former police officer and school administrator living in Florida, made more than 22 trips to Connecticut, the complaint notes. Sklanka was Halbig’s driver, camera operator and helped co-host broadcasts asserting that the Sandy Hook shooting was a hoax. The two even filmed and harassed the children’s families at the St. Rose of Lima church in Newtown on June 2, 2015. Halbig raised more than $100,000 for his activities. Jones encouraged Halbig to continue his investigation on his show and repeatedly advertised his website sandyhookjustice.com. Adam Lanza carried out the Sandy Hook shooting on Dec. 14, 2012. In addition to taking his own life and that of his mother, Lanza killed 20 first-grade children and six school staffers. Two others were wounded. The plaintiffs, who seek punitive damages, include Jacqueline and Mark Barden, parents of Daniel; Nicole and Ian Hockley, parents of Dylan; Francine and David Wheeler, parents of Ben; and Jennifer Hensel and Jeremy Richman, parents of Avielle. Two of the six slain adults were first-grade teacher Victoria Leigh Soto and Principal Dawn Hochsprung. Soto’s mother and three siblings are named as co-plaintiffs, as is Hochsprung’s daughter, Erica Lafferty-Garbatini. 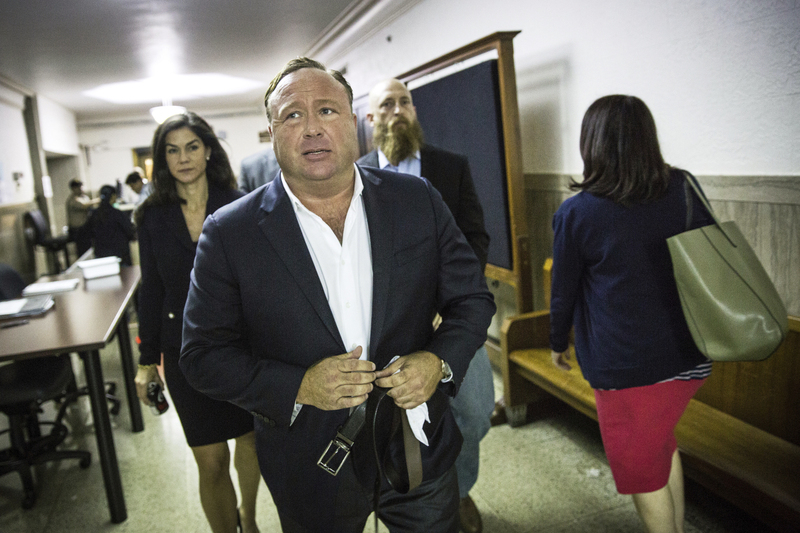 Jones, InfoWars, Halbig and Sklanka are named as defendants, as are Genesis Communications Network Inc., Midas Resources Inc., Free Speech Systems LLC, Infowars Health LLC and Prison Planet TV LLC.